This Medicare Levy Surcharge vs Private Hospital Insurance Calculator aims to help Australians to decide whether they should pay Medicare Levy Surcharge or buy Private Hospital Insurance in order to save money. According to Privatehealth.gov.au website, "The Medicare Levy Surcharge (MLS) is levied on payers of Australian tax who do not have private hospital cover and who earn above a certain income." From 1 July 2012 (i.e. financial year 2012-2013, FY2013), the Medicare levy surcharge (MLS) income test will change. If you are single, earn more than $90,000 and don’t have private health insurance hospital cover you will pay the MLS. If you are a family, have a combined income of more than $180,000 and don’t have hospital cover for you, your partner, or your children – you will pay the MLS. From 1 July 2012, the private health insurance rebate will be income tested. If you expect to earn more than $90,000 as a single, or more than $180,000 as a family in the 2015-16 financial year, you are most likely to get a rebate less than the usual 30 per cent. Income for surcharge purposes is only used to determine whether you are liable to pay. It is not used to calculate how much surcharge you pay. The Medicare levy surcharge is only levied on the total of your taxable income and reportable fringe benefits. Download FREE Medicare Levy Surcharge vs Private Hospital Insurance Calculator (2018-2019 financial year)! Download FREE Medicare Levy Surcharge vs Private Hospital Insurance Calculator (2016-2017 financial year)! Download FREE Medicare Levy Surcharge vs Private Hospital Insurance Calculator (2015-2016 financial year)! Download FREE Medicare Levy Surcharge vs Private Hospital Insurance Calculator (2014-2015 financial year)! Download FREE Medicare Levy Surcharge vs Private Hospital Insurance Calculator (2013-2014 financial year)! 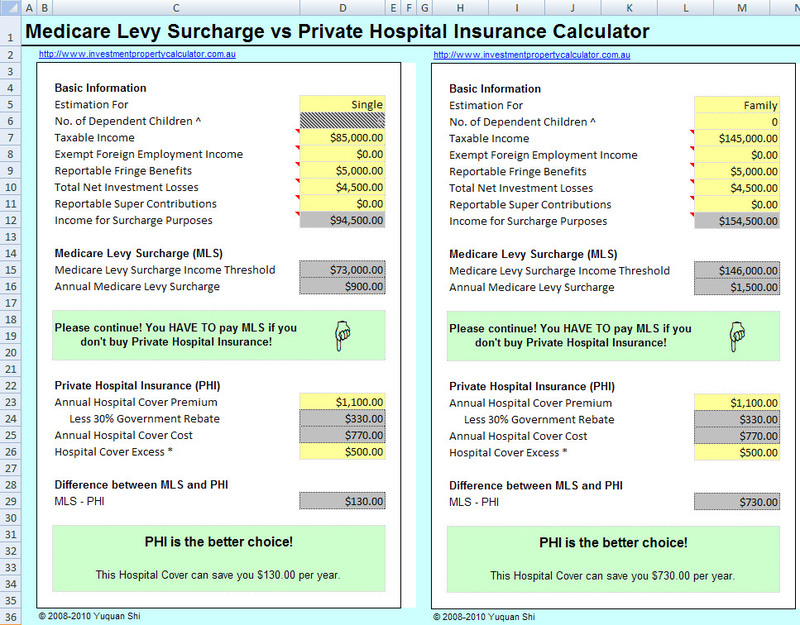 Download FREE Medicare Levy Surcharge vs Private Hospital Insurance Calculator (2012-2013 financial year)! 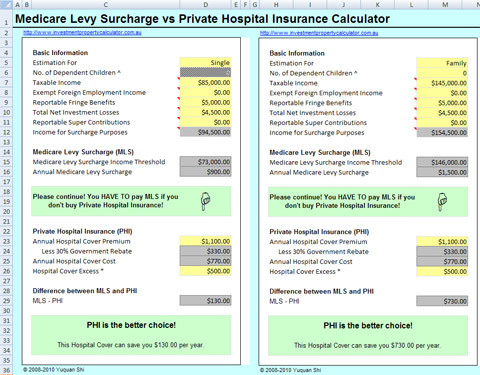 Download FREE Medicare Levy Surcharge vs Private Hospital Insurance Calculator (2011-2012 financial year)!